In February, we covered Ursula Goff, an art-loving hair stylist, who dyes her clients' hair based on the color schemes of famous paintings. Now, the Wichita, Kansas-based colorist has taken the concept one step further, printing the artwork right onto her customers' hair. As Laughing Squid reports, Goff is using hair dye to reproduce famous works like Vincent van Gogh's The Starry Night and Pablo Picasso's Le Rêve. "Back in December, while I was in the middle of doing Airacha’s Van Gogh colored hair, I had an idea," Goff wrote on her blog. 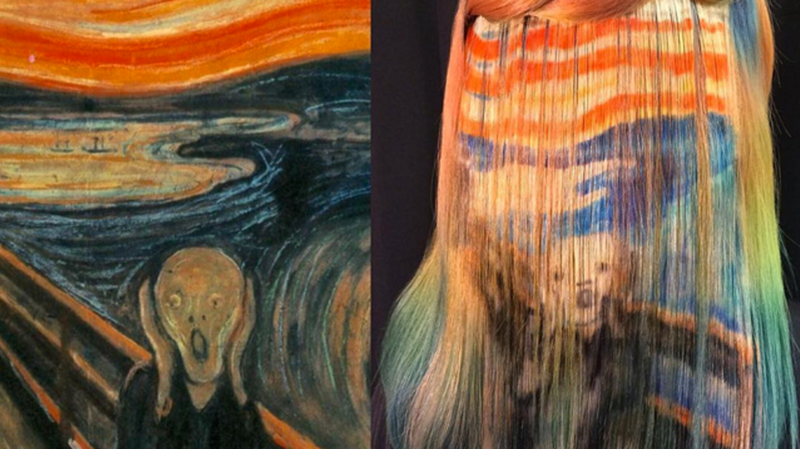 "I wondered how hard it would be to actually paint Starry Night—the painting—onto some hair. I thought it might be fun to try painting on hair instead of a canvas (for everyone needing a reason why I do anything)." All the paintings are done by hand, without the help of stencils or projectors. Instead, Goff recreates the designs with hair dye (like Manic Panic and Redken) by first drawing a mockup. Then, she places a hair weft over the draft and "traces" it with a sable paintbrush. Take a look at some of her designs below.